Dan worked on replacing the old rubber tires on the upper and lower wheels while I tackled the pulleys. A lot of the old rubber came off quite easily, but he needed a clean surface for the new tires to grip, so he had to get every last bit of it off. I tried to pay attention to what he was doing when I could, but I also didn’t want to get too distracted from my own tasks. So I can’t say it with 100% certainty, but it looked like he was pressing a flathead screwdriver to the wheel, then spinning the wheel, using the screwdriver like a scraper. That did a good job of removing the rest of the rubber and then he only had a few little bits here and there to deal with. When it came time to put the new tire on, he was able to stretch it on without soaking it in hot water or heating it up in any way. Then, in order to equalize the tension in the tire all the way around the wheel, he inserted a small cylinder (in this case, it was a small baton-style flashlight) under the tire (i.e. between the tire and the rim) and ran that around the rim a few times. Both tires went on with relative ease. And because of the way they are designed, I didn’t need to do anything to give them a crown. While Dan worked on that, I pulled off the old aluminium pulleys (which I gave to Dan, so I don’t have any pictures of them; sorry) and replaced them with the new cast iron ones. The only real problem I had was that someone had beat on the aligning pins with a metal hammer at some point, and they were both mushroomed out on the ends. 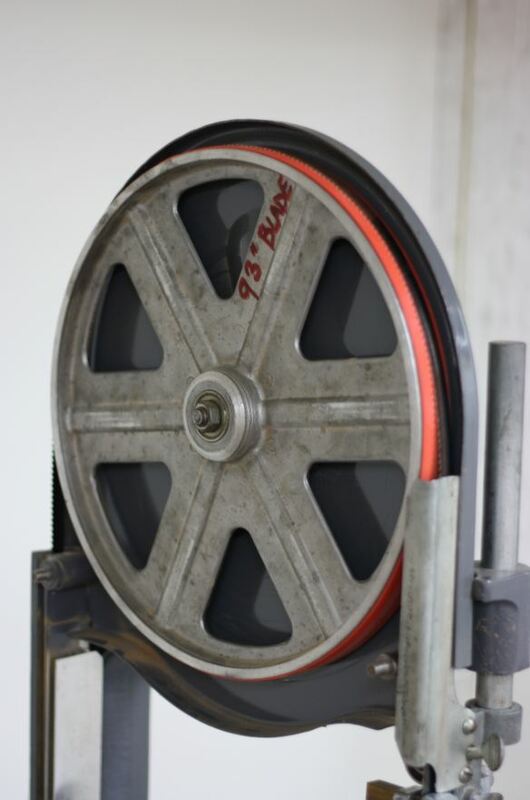 This made getting the old pulleys off difficult and it made getting the new pulleys on pretty much impossible! But after a few minutes of work with a double-cut file, and an ample amount of WD-40, they slid on without any problems. Since I was already working on the pulleys, I went ahead and installed the Powertwist Link belt, as well. 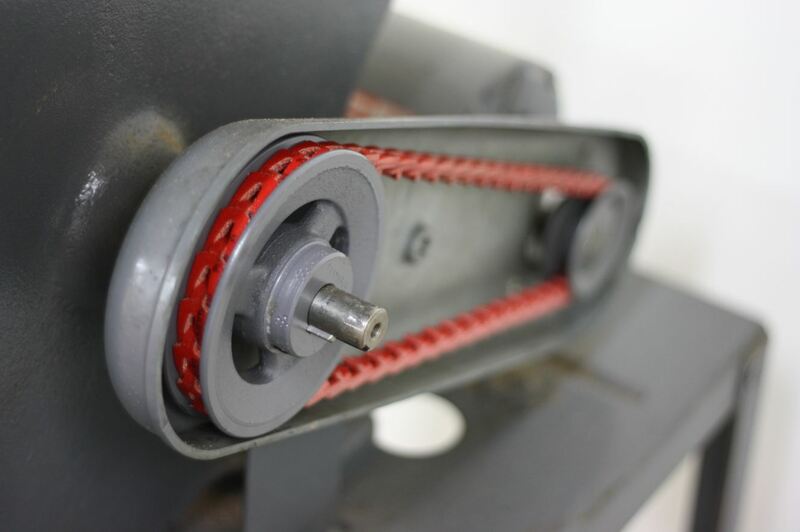 If you’ve never installed a link belt before, there are really only two things you need to know about them – the smooth side goes on the outside and there is a right direction and a wrong direction. It was easy to figure out which direction to install mine, since it had little arrows printed on the side every few inches. If your link belt does not have arrows, then just take note of the picture. 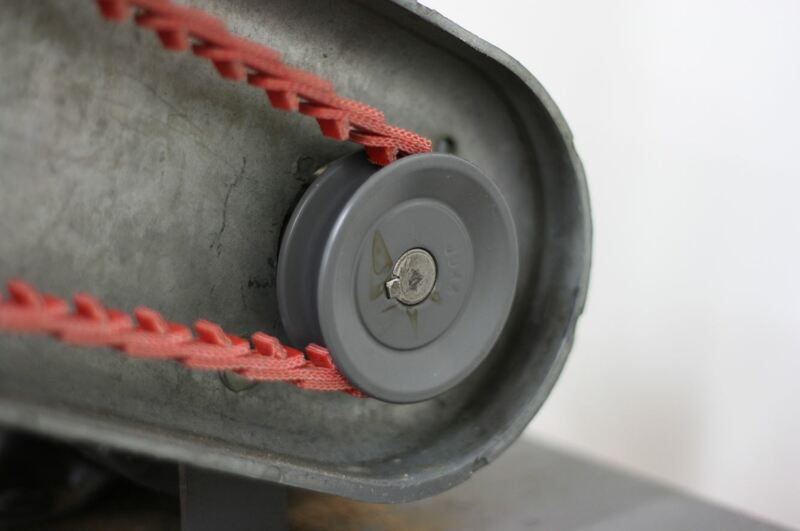 The large pulley is spinning counterclockwise (as is the smaller pulley, funny enough), so you want the double-prongs of the Y-link to point in the direction the pulley spins. That’s easy to remember, right? 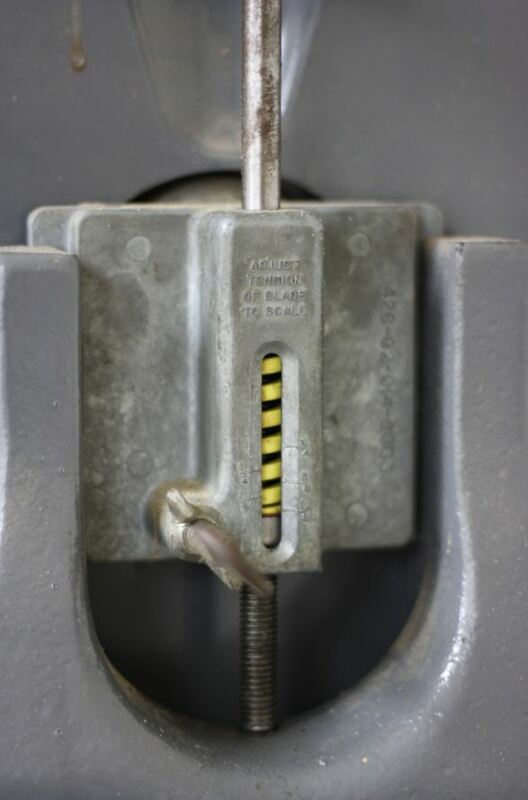 A stronger tension spring makes it easier to put things… under pressure. If you can unscrew threaded rod, then you can replace the tension spring. Really, I’m not sure there is much I can say here but to remove the old tension spring and drop the new one in place. Do note that if you replace the standard spring with a much stronger high tension spring, like I did, then the factory tension marks on the window around the spring might not be accurate anymore. 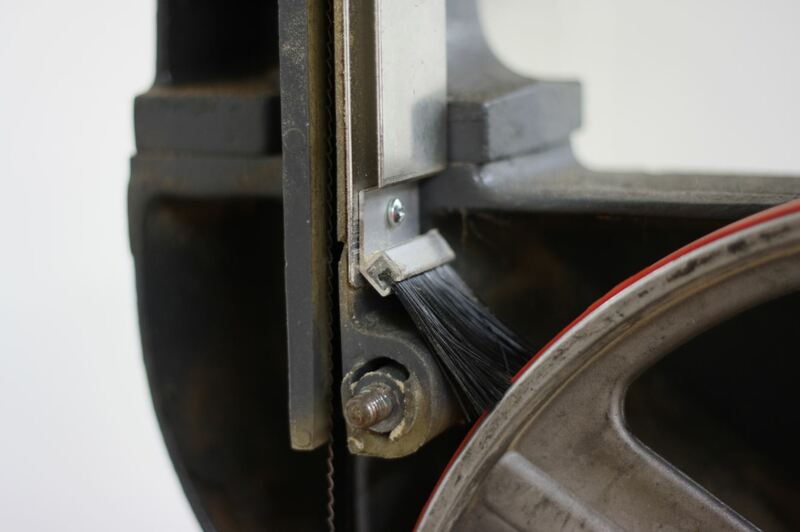 The wheel brush was pretty simple to install; there was really only the one place where we had room and something to attach it to. In this picture you might also be able to tell the blade guard had snapped off at some point and was fixed with a piece of aluminium. That just made drilling the mounting hole a little easier. The wheel brush… helpful? Meh… probably not. The last adjustment we made, the guide holder, was pretty straight forward, as well. You just have to loosen a thumb screw, pull out the old guide holder and slide the new one in place. Mine seems to be really close to the blade on the right; Dan didn’t think it was an issue, so I’m not going to worry about it. The nice thing about using wood for your guide blocks is that you can practically press them to the saw, counting on the saw to cut a small kerf for the tooth set the first time you start it up. After that, the self-lubricating lignum vitae should keep the blade running true for a long time. There are a few things I still need/want to do to this thing before I call it “done”. Dan showed me where the original leveling pin had been broken off, so I need to replace it. 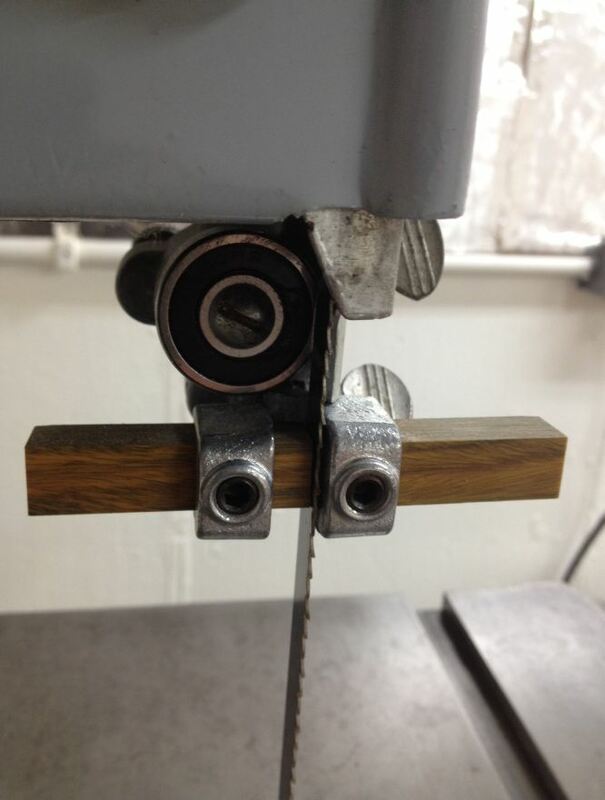 The leveling pin is an adjustable stop that indicates when the table is 90 degrees to the blade. It makes it easy to return to level if you have to adjust the table angle for any reason (or remove it). While I’m ordering that part from Iturra, I figured I’d get a few of the phenolic inserts he sells so I don’t have to use the original metal one. I was thinking about getting one of the commercial tension adjusting handles that essentially ends up adding a crank wheel to the tension adjuster, above the level of the upper wheel house, so you don’t bang your knuckles on the back when you adjust the tension. Dan said I could save some money by just replacing the threaded rod with longer threaded rod and then locking the handle in place with double-nuts. I’m still undecided there. The last thing I want to eventually add to the table saw is a fence. I’m thinking I’ll go with the 18″ Kreg fence; it seems like it would be easy to install and adjust, and that suits me just fine. Hope you find the extra photos useful. As always, though, if you have any questions, don’t hesitate to ask! If I don’t know the answer, I can always find out. I have a delta…. its been put through the ringer over the years. On my last major project for a customer (that was nearing its completion deadline) the blade kept coming off. After taking a closer look the tires were slipping off in turn throwing the blade off. Not sure if it was the Texas heat or the fact the tires were so old they were loose on the wheels! You ready for this? For a quick fix I took the tires off, wrapped them in duct tape to make them thicker, and put them back on the wheels. Worked like a dream. One of those days I was in a huge time crunch and didn’t have time to fool with it. Southern ingenuity for you. Wow! Not sure I’d have ever risked the duct tape on the bandsaw! I had the benefit of having a retired shop teacher helping me with me restore. He popped the old tires off and had the new ones on while I was fussing with replacing the cheap pulleys with cast iron ones (I had to do some filing to fix hammer blows by a former owner on the large pulley shaft). Do you Know about benchtop bandsaw? If you Know.please tell me. Sorry, Richard, I don’t. Way early in my woodworking, before I knew better, I bought a Ryobi 10″ benchtop and it was crap. I was never happy with it. I finally left it out on the curb and someone picked it up and I feel sorry for them. I know Grizzly, Jet, Rikon, Craftsman and a few others have 10″ benchtop models, and I’m sure they are probably more dependable and sturdy than the one I was using 15 years ago, but I have no experience with them I can relate to you. I read your comment. Hope you have many good article for us.